Caddy spoons were a decorative addition to tea caddies. The antique tea caddy spoon, once one of the most fashionable items in an 18th-century home, is now a popular collectible among antique lovers. These short, squat spoons used to be an important and useful accoutrement for wealthy ladies and gentlemen who practiced a daily tea ritual in their household. Tea caddy spoons were used for a simple and single purpose, to dispense loose tea leaves from a tea caddy. The tea caddy was a special canister that held the precious household tea. The lady of the house often kept a proprietary key to the canister to ensure that servants and others didn't have access to the precious leaves. The caddy spoon was then used to dispense tea into a mixing bowl or infusion pot. What is an Antique Tea Caddy Spoon? Traditional antique tea caddy spoons are often fashioned like a flat shell, perfectly proportioned to ladle out tea leaves from the caddy. Other spoons were made in an array of shapes and sizes during the 18th century. By the late-19th century tea had become a relatively inexpensive household commodity, and tea caddy spoons were crafted en masse from less-pricey metals. However, silversmiths all over Europe and on the east coast of the United States continued to hand-craft exquisite specimens--an art form that continues today. Some of the most intricate tea caddy spoons were made by silversmiths in Birmingham, England and were engraved to mark special occasions. Shells, fluted shells and leaves were popular shapes. A pierced caddy spoon served as an apparatus to pluck out a stray tea-leaf floating in the teacup. In its most basic form, a tea caddy is any receptacle for tea. True antique tea caddies are stunning items that were coveted by the wealthy during the late-18th-to-late-19th centuries. 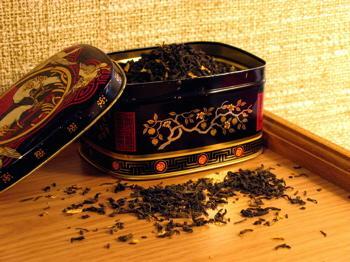 The tea caddy evolved into an incredibly elaborate box with a lid and lock. It had up to three divisions with the center being reserved for sugar, another hot commodity during this era. Today you can find antique tea caddy spoons in a range of prices. One of the most valuable spoons sold at auction for more than 2,000 British pounds. It was designed by 20th-century craftsman Omar Ramsden in 1931 using an Art Nouveau style and was decorated with semi-precious stones. Luckily, since most of us don't have several thousand dollars to splurge on a simple tea caddy spoon, there are other options. Many wonderful versions can be purchased for as little as $50. RubyLane.com - Ruby Lane is a conglomerate of more than 2,000 independently owned online antique dealers. Some of these offer an array of stunning tea caddy spoons, ranging from a rare tortoise shell spoon to a 1750 sterling silver caddy spoon. GoAntiques.com - GoAntiques is a virtual warehouse of antiques with more than 1,300 dealers from 31 countries. The website offers shopping and live auctions. Just type "tea caddy spoon" into the search and begin shopping. AntiqueSilverSpoons.co.uk - Based in England, Antique Silver Spoons is a silversmith company that specializes in buying and selling antique silver. They not only sell silver spoons, but also provide extensive information about the different varieties of spoons, flatware patterns and why spoon collecting is so popular.